Smartphones are handheld pieces of multifunctional wonder that can act as telephones, calendars, browsers, and cameras without even breaking a sweat. With hundreds of available apps, smartphones are now gaming consoles, e-readers, and even MIDI controllers. MIDI controllers electronically record and store music, adjust the acoustical features of electronic instruments, and can even cue theatrical effects in a live performance. Actual MIDI controllers are large and difficult to transport, but MIDI apps make the technology convenient and portable. There are as many MIDI apps today as there are stand-alone devices. No matter what type of functionality you’re looking for, you’re sure to find an app to support it. If you want a minimal approach to smartphone MIDI technology, you can even access some great apps for free. MIDI Memo Recorder for iPhone — This simple app records and plays back audio and sound bites from your instruments. FingerPlayMIDI for Android — This records music from either OSC messages or the app’s unique FingerPlay format. The finished compositions are then sent to the user’s computer via WiFi. GarageBand — The classic program for Macs is now available on iPhones with a full array of features including special effects for your electric guitar and vocal recording with the phone’s microphone. In addition to these multi-functional MIDI apps, there are also applications for various smartphones geared specifically toward drum, keyboard, or guitar use. Most users find MIDI apps that connect to real musical instruments to be the most functional. However, if you don’t mind sacrificing some sensitivity in the keys, you can even play an instrument directly on the smartphone. Before you head to your local music store for a new MIDI controller, you just might want to visit your app store first. With the proper equipment, downloading a MIDI app is quick and easy. There are MIDI apps available for almost any smartphone device. With the free T-mobile prepaid cell phones, you can connect any unlocked smart phone to a new T-Mobile plan. Your old smartphone can quickly find a new life once again. If you’re planning to send data from the MIDI app to your computer, you may need to download the program to your computer as well. 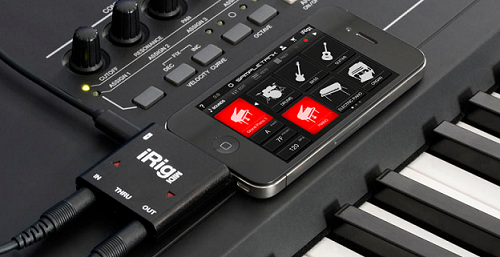 Each MIDI app operates differently, but the best way to use most of these applications is with a special plug-in device like the iRig. The basic iRig device is a connector that hooks up your iPhone to a guitar and headphones so you can listen to the sound, play your guitar, and take advantage of the features of your MIDI app while everything is connected seamlessly. The more advanced iRig MIDI connector device brings even more functionality to your setup with three MIDI ports, two LED ports, and a micro USB port so you can connect additional devices like a synthesizer and drum pad. If you’re not already itching to get your hands on one of these great MIDI apps to turn your smartphone into a powerful accessory for music recording and customization, here are a few more compelling reasons to give this technology a try. MIDI apps for your smartphone add a whole new level of functionality that any musician can appreciate. If you’ve never worked with a MIDI controller before, you’ll be astonished at the compositions you’re able to put together with these powerful recording and customization tools. This post was written by Natalie Bracco, If you find above post on “Turn Your Smartphone into a MIDI Controller” interesting and useful, please share this post with your friends using the share tools on the left hand side of the browser or the ones under this post. Please if you haven’t liked our Facebook page simply click on the “Like” button on the right hand side of the browser. You can also follow us on Twitter right under the Facebook page. I hope you read my blog post on “Top Ten Reasons Why You Should Buy the Samsung Galaxy Note Smartphone“. If you like this blog posts Subscribe to NetMediaBlog Feeds by Email so you can be getting more of my posts on your email even when you are offline.